Freelance hasn’t kept me as busy as I would have hoped this year. I don’t have the extra money to buy whatever ornaments and decorations strike my fancy, let alone extravagant gifts. 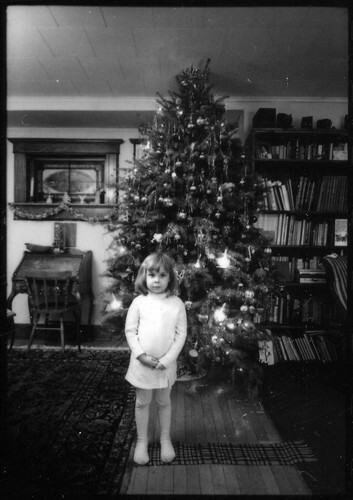 Instead, this is an opportunity to rewind to the Christmases of my youth. To use the ornaments I’ve collected from past years of color-coordinated decorating, and to let my tree reflect those childhood memories of color and light. And don’t forget the paper chains! Truth in blogging: Candice DeVille, the author of Super Kawaii Mama, is holding a contest where entrants must write how theyâ€™d create the perfect vintage Christmas, in 200 words or less. The lucky winner gets the MOST. AMAZING. EVER. Prize package chock-full of gift certificates from some of my favorite vintage/retro vendors. 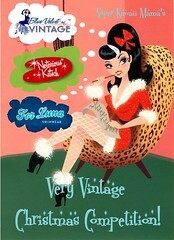 Click on over for more details on this Very Vintage Christmas Competition. I LOVE that photograph! And I love your approach to Xmas this year! The first 8 years of my life were spent with “homemade Christmases” and regardless of how much money I’ve got to spend on Christmas, those first 8 have still remained as the best ones ever!!! I like the amount of time and effort you put into Christmas. And Halloween. And Thanksgiving. Go you.